It's chol hamo'ed, the middle days of Passover. I've eaten matzah with almond butter for lunch every day this week. But there is great food associated with Passover as well. We had seder at the home of our good friends Charlie and Abby; Abby talked about the menu here. Then there's my favorite, matzah ball soup. 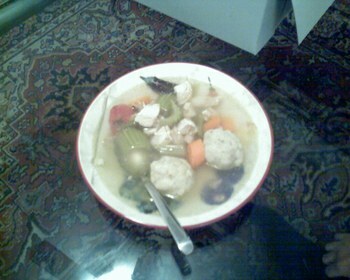 The matzah ball soup I made this year is above. I use my great grandmother's recipe for the matzah balls, which comes out dense and chewy - I love them, no light and fluffy matzah balls for me. This year I used a whole chicken and some carrots and celery for a tasty and hearty soup. The other passover standby is matzah brei, a mixture of broken and softened matzah pieces and egg that gets fried in a pan. For most of my life I'd always eaten them sweet - adding nothing to the matzah and egg while cooking, and then sprinkling sugar and cinammon or spreading jam on the finished product. A couple of years ago, though, we got a little sick of that, and I came up with the idea of making a savory matzah brei. I sauteed some onions and mixed these back into the egg and matzah mixture before cooking, along with some salt and pepper. The result was a nice change from the tired plain matzah brei, a little more satisfying and less breakfasty. Last night I made such a savory matzah brei for dinner; in addition to the salt and pepper I added some garam masala for bite.